This post is made in memory of two women pilots who had a profound effect on this writer’s life. Your webmaster is such only because a woman aviator shamed him into continuing his interest in becoming a pilot, when his first aerobatic (spin) maneuver scared him witless. Of course he was not being at all truthful with that retort, but how could a young man say he was scared to a woman, who clearly did enjoy the abrupt contortions through which the small airplane had just passed. Feigning calmness, your hapless webmaster continued that flight instruction session, never once reporting how frightened he’d actually been. Had the instructor behind him been a man, however, it would have been this author’s last and final attempt at learning how to fly, simply because he’d have quickly replied to that same question with a curt, “Let’s go back to the airfield and land.” In other words, he’d have quit his attempt to become a pilot. Set of wings awarded each successful pilot graduate of WASP training during WWII. 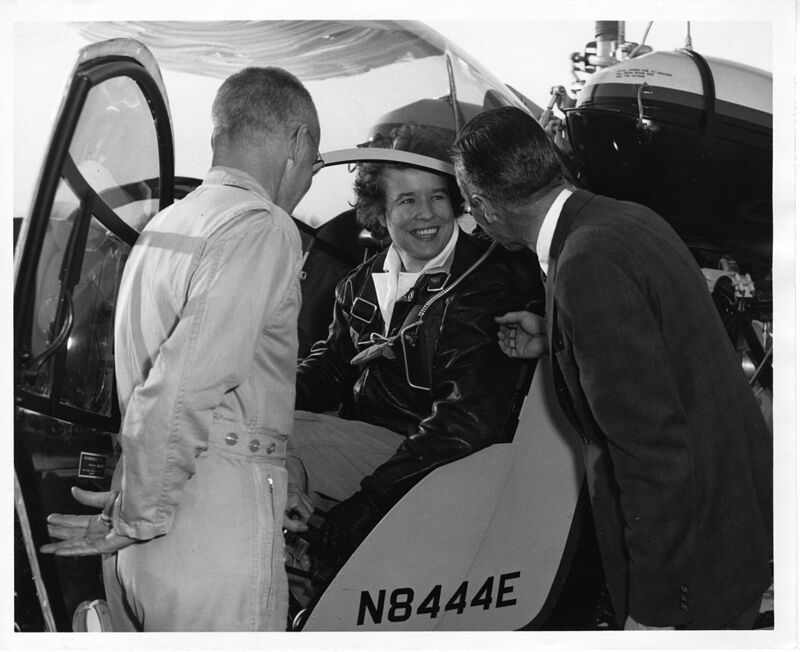 Dora Dougherty, PhD, Test Pilot and Engineer at Bell Aeronautics Corporation, in cockpit of Bell Helicopter in 1961. Needless to say, had he quit, he’d not have continued his training, would not have become a pilot, and would not have joined the USAF, either. His life would certainly have taken an entirely different turn. As most of us know, what may seem like a small, if not insignificant experience in our lives, can completely alter our entire future – – – and the personal history is writes for us. In any event, that flight instructor, along with over a thousand other brave women, had recently been furloughed by the U.S. Military establishment, because WWII was nearing its end, allowing many combat male pilots to return home from Europe. It was planned that these returning combat veterans would take over the ferrying and test-piloting work the volunteer women had been so capably accomplishing. Exactly 73 years ago this month, in December of 1944, the Women Air Airforce Service Pilots (WASP) organization was suddenly and unexpectedly terminated, putting these women aviators out of the work they loved, a job for which a number of them (38) had already given the ultimate sacrifice. There were only 1,074 young women selected as WASP pilots out of over 25,000 applicants. 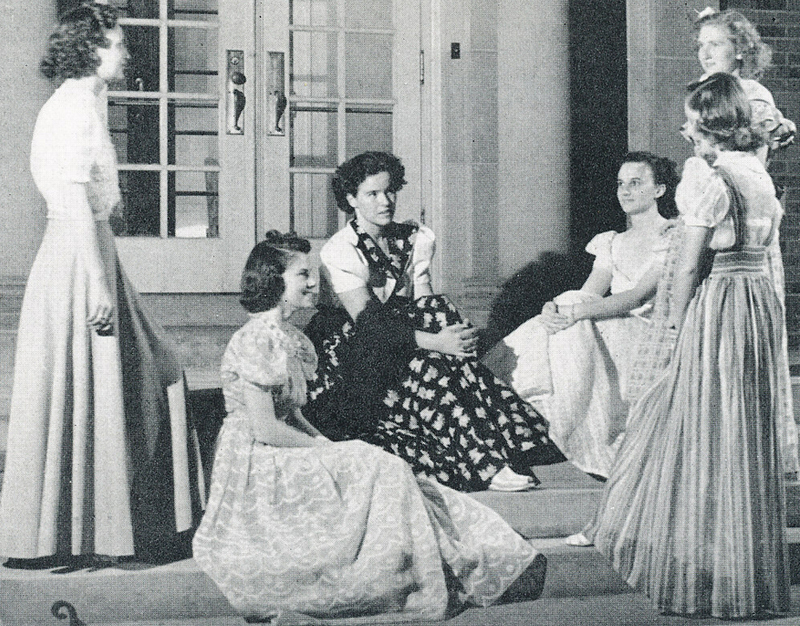 Dora Dougherty (Center) at Cottey Women’s College, Nevada, MO, as an actress in one of their student plays in 1940. 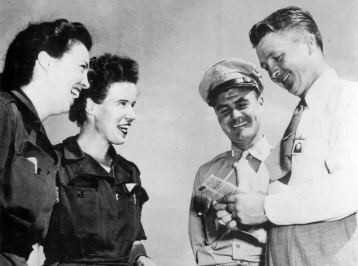 Dora, 2nd from L, with Colonel Paul Tibbets, when she was a B-29 Demonstration Pilot. The two ladies helped convince the wary male Air Force pilots that the airplane was safe to fly! The same “macho” psychological phenomenon that worked to keep this webmaster flying. Tibbets was pilot of the B-29 which dropped the world’s 1st Atomic Bomb over Japan. Not until 1977, 33 years after their dismantling, were the WASP finally awarded full recognition by Congress for their efforts during WWII, when they were given full military veteran status. This successful campaign to have them awarded regular military veteran status was led by Arizona’s Senator Barry Goldwater, himself an Air Transport Pilot during the war, and a man who also just happened to have been taught to fly by a woman aviator, and old friend of your webmasters, Ruth Reinhold (see below photo). Ruthie was too old to apply for duty with the WASP, but all during the war, she did do her part towards helping the aviation war effort. Ms. Reinhold used her piloting skills by instructing Air Force pilots in how to fly by instruments (a necessity during inclement weather, when they couldn’t see the ground below them) when piloting its B-24 “Liberator” heavy bombers. Ruthie Reinhold – Her portrait as displayed at the Arizona Women’s Hall of Fame at Pima Air Museum in Tucson, AZ. This book by Ruthie Reinhold can be purchased at Amazon.com by merely clicking on the above book’s cover. (Ruth’s portrait is at the left) Ruth later became Barry’s personal corporate pilot, a job she held for over 20 years. In fact, when Mr. Goldwater was the Republican Party’s candidate for President in 1964, Barry went out of his way to be sure Ruthie had the chance to pilot the campaign’s chartered Boeing 727 on its final flight to San Fransisco. It was the thrill of her lifetime, since she’d never before flown a jet, let alone a popular airliner of the day. It was one of the largest planes Ms. Reinhold had ever flown. Although Ruthie had not been a member of the WASP, she nevertheless continued her career in aviation throughout WWII. Much earlier on, well before the war, she had been one of the original 99 female aviators who founded, in 1929, the “99’s,” the International Organization of Women Aviators, whose first President was Amelia Earhart. 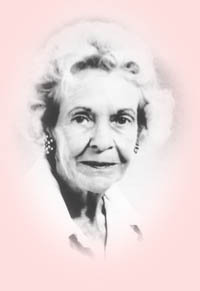 Photo of Ruthie in her later years, one on display at the Arizona Historical Society’s Collection bearing her name. 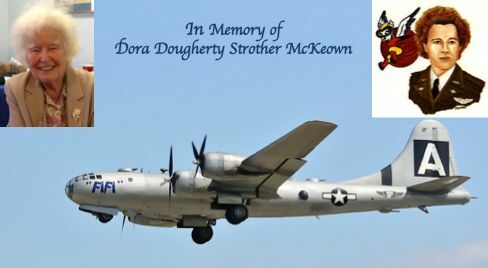 In any event, as a way of helping the campaign to fund the new film, COMING HOME, we are posting this story as our way of both recognizing these brave women aviators, and of helping to preserve their contribution to the history of how we won WWII. Here below is the short (2:36) video story behind this new film and here is where you can find their promotional pages. And, here below, follow a number of other fascinating historical video clips of this group of extraordinarily talented and courageous women – – – one of whom kept this writer’s eyes on the sky. Dora is featured in this: The above was by PBS – Film is 49:23 long and is the WASP’s full story. This entry was posted in AVIATION NEWS on December 10, 2017 by FASFRIC. The best book I have read about the WASPs is, “Goodbye Glamour Gals,” and I suggest you read it. You can get a copy on Kindle, or buy the book. It is an excellent read. It begins with Nancy Love’s story. So many of the books about the WASP never mention Nancy and her role. Also, in 2002, Dora gave me a set of very special earrings. The earrings were actual tiny, working, spark plugs that had been given to her at the completion of the 1st Powder Puff Derby. Thanks so much for the input, Nancy. Didn’t realize you’d known Dora. She sure changed, or held the sky-bound course of my life, when I was about to change it towards Terra Firma, so to speak. What a small world! Thanks for the book recommendation, too. Sounds great. I know Ms. Love was a huge contributor to the entire WASP related program, but know little else about her, so will get that book. Your own book is a wonderful work of inspiration. Few realize what a great contribution to cockpit safety Dora made while with Bell, especially in regard to improved ergonomics and standardization of layout . . . Thanks KLEE. Appreciate your comments!